My favorite summer pastime is antiquing on Rte 1 in Maine. Columbary House Antiques (http://columbaryhouse.com) in Cape Neddick is a stop I make annually when searching for unique design finds. I always enjoy a chat with Donald and Jack, the shop’s charming owners. 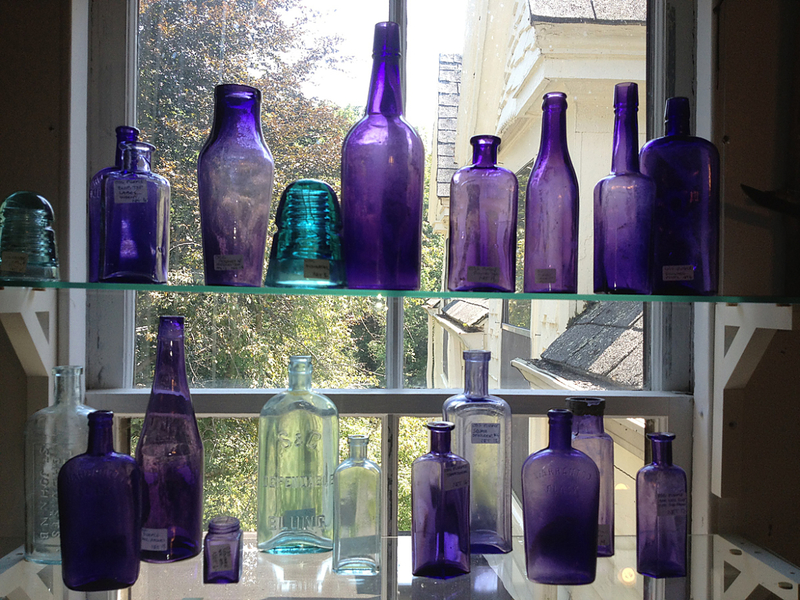 Today I came across a beautiful display of purple glass bottles that stopped me in my tracks as the sun passed through them on a simple shelf in front of the window. Glass can be such a beautiful design element when placed to catch the light. As the “Purple Bottle Story” goes, these bottles were all manufactured before WWI and their distinctive color comes from Manganese, an ingredient used in glass-making until about the turn of the 20th century. Manganese changes color in certain light conditions. These bottles have been enhanced by exposure to a cobalt/ultraviolet light bringing out an intense purple from the Manganese. Alone, or combined with other glass, these purple bottles would be stunning as vases or simply as light-catchers.